This is a Basic version of Polaris - Low Poly Terrain engine. To get the full version, visit this page. 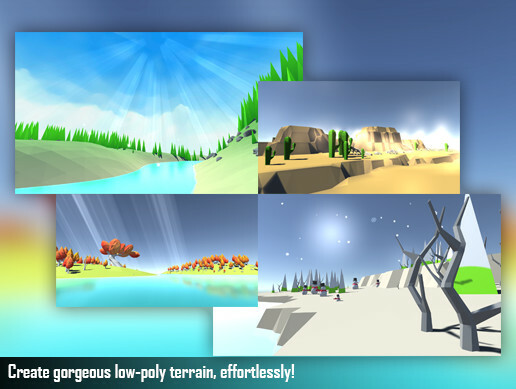 Polaris is a user friendly terrain engine dedicated to help you create gorgeous landscapes, deeply focused on low-poly and stylized world, that can run well on both Mobile and Desktop applications, save you a lot of time and effort! Polaris is carefully designed to totally eliminate the frustration of complexity, giving you the fastest and easiest experience of exploring and creating, empowered by the latest techniques from the inside, giving the highest quality of achievement. Even if you are a beginner or an advanced creator, it is just the right tool for you! Polaris cleverly combines the traditional Sculpting method with the modern Procedural one, offer you the most flexible workflow, feel free to unleash your power of creativity! Polaris also comes with sample assets and example scenes for you to play with. You can even use them in your commercial projects. Have fun! Low Poly environment has become the most popular trending in game development, especially for small and medium size projects. However, creating a gorgeous looking low poly landscape is NOT an easy task. It DOES require a lot of skills and efforts. You can spend several hours in some modelling applications to sculpt the terrain, then import it to Unity, and repeat until satisfied. It’s hard, it’s rough, it’s inconvenient, it’s time consuming, and that’s the point, time is money, save time is save money! Polaris is created to simplify the process. With Polaris, you are SAVING, NOT SPENDING! You can discover other great terrain engines out there, but they are dedicated for AAA environment, while Polaris is deeply focused on low poly and stylized. Choose the right tool, wisely! - Super easy to use, clean and tidy interface, in-depth documentation. - Support 2 types of terrain, one for small & stylized, with simple setup, one for larger scale with more advanced features*. - Procedurally generating terrain base shape, with various settings. - Import height map data from a regular texture, no RAW file needed. - Other utility features like saving procedural mesh, extract data from terrain, etc. - No 3rd party plugin, all high quality, fully documented C# source code included. Note: Features with (*) are simplified, with (**) are only available in Pro version! - Fully satisfied result, gorgeous terrain achieved within clicks. - Save a ton of time and money! - Continuous development, more interesting features ahead. Follow the forum thread for newest announcement.